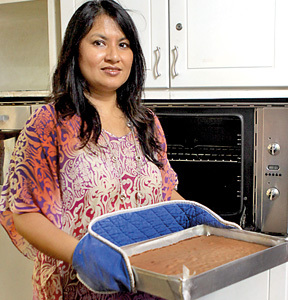 At the centre of Sita Goonetilleke’s little empire are two sturdy ovens. In their warm, glowing hearts, the basic ingredients of her trade, the butter and eggs, the flour and sugar, are transformed into that most beloved dessert – cake. “It’s a neat science,” Sita says, “It’s all to do with weights, measures and temperatures. You have to be extremely precise.” That Sita runs a thriving business of her own, one she began 17 years ago, is evidence that she has it down to an art. While Sits’ Cakes and Desserts are much sought after in Colombo, it is her signature chocolate cake that is most likely to go down in legend. Two layered and covered in a rich chocolate icing, the cake accounts for 95% of her business. Having taken an ordinary recipe and tweaked it to her satisfaction, Sita says the resulting batter takes 14 minutes to bake to perfection in one of her ovens. She’s had both these appliances for just over six years. “Anyone who comes into my kitchen is actually quite horrified that I manage with a domestic type of oven,” says Sita, explaining that it would be easy to assume an industrial oven would be required to cope with the demands of her business. After all, on an average day, Sita and her team will bake 40 to 50 pounds of cake, running the ovens from 7.30 a.m. to 7 p.m.
“I think some of the tastiest cakes in the world come from Sri Lanka,” says Sita. Still local bakers like herself have had to adapt to the times as people have become increasingly conscious of their sugar intake. Sita says she thinks her cakes also find appeal because they aren’t too sweet. In fact, she has just begun distributing a new, revamped menu, one which is filled with what she describes as light, airy desserts. On the list are names that amount to gastronomic poetry – among many others you’ll find the Nutty Kahlua Meringue, the Paradiso with Belgian Chocolate Sauce, the Chocolate Marzipan Ganache Cake, the Strawberry Torte and the endearingly dubbed Whoopie Pie. Some part of each, be it a torte base, or a layer of cake, will come out of her ovens. While the ovens work their magic, the scent that drifts from them fills the house. Living in a home that smells enticingly of cake might sound like a perk, but Sita says combining her place of business and her residence offers its own challenges. Her 14-year- old son, Kalon for instance, complains constantly that everything from the fridge handle to the surfaces of tables “feels buttery,” says Sita, laughing. She keeps promising him they’ll move out soon. He keeps wanting to know how much time exactly ‘soon’ translates into. Sita, who grew up loving baking, says it is now an intrinsic part of her life. So much so, that her husband, Cheman, who loves the great outdoors knows he needs to set up an oven on site for Sita before he can hope to lure her out of Colombo for any extended period of time. “Everyone knows I can’t survive without baking,” Sita confesses. Tags: Cake, Sita Goonetilleke, Sits Cakes. Bookmark the permalink.